Kiribati’s Vice President and Minister for Internal Affairs, Hon. Teima Onorio, officially opened two workshops on Local Economic Development (LED), in September. One was held at the Betio Town Council (BTC) from 10th to 11th September, attended by Councillors and official of BTC and TUC. The other was held at Abaokoro for ETC Councillors and officials, from 15th-16th September. Both workshops were aimed at building the capacity of BTC, TUC and ETC in the planning and implementation of LED in their communities. In her opening remarks at the BTC LED Workshop, the Vice President and long-time Board Member of CLGF, welcomed the initiative by CLGF and financial support by the EU that has allowed the workshop to take off in Kiribati. She also thanked the Councillors and senior staff of the Councils involved for attending and advised that the workshop would provide participants with relevant skills and knowledge on LED that would contribute to growth and reduce poverty in their communities. She also challenged the Councils to review their related legislations, including the Business Bye-law, to make them supportive to LED. By citing LED cases in other Commonwealth countries that involve women and creative ideas such as reuse of waste, she encouraged the participants to widen their visions on LED. 24 September, KiLGA’s office, Betio – Ross Hopkins of TRIP Consultants, a private firm based in Queensland, Australia, visited KiLGA’s officers to seek information on tourism on the outers islands, particularly those that involve Councils. KiLGA is involved in Tourism development on the outer islands by virtue of its role as the coordinating NGO for Councils, many of which operate guesthouses and tourist-related services in their areas. KiLGA has also assisted Councils develop their strategic plans, many containing tourism development projects plans aimed at expanding individual Council’s revenue base. Furthermore, the Council Profiles published by KiLGA, also contains socio-economic information that are useful for tourism development on the outer islands. 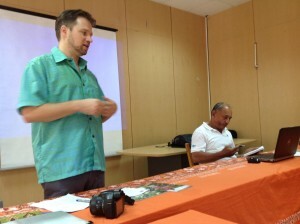 The Profiles have identified resources on islands studied that can be opportunities for tourism. Dr. Terence Hay-Edie CPMT (Pacific), briefing members of the National Focal Group for the GED Small Grant Programme, with Dr. Komeri listening. 5 September, Parliament Conference Room, Ambo – The Executive Officer of KiLGA has been appointed a member of the NFG for the Small Grant Programme for a term of three years from 2015. The main responsibility of the NFG is to provide policy advice and strategic visioning to the Small Grants Programme, as well as review and approve project proposals submitted to the Programme. Another responsibility is to assist with the monitoring of the projects funded under the Programme. The appointment was made by the Resident Representative of the UNDP office in Fiji. 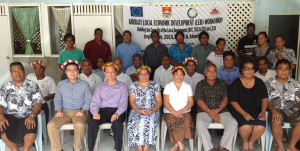 The GEF/ UNDP’s Small Grant Programme, launched in Kiribati in 2007, provides funding and technical assistance to grassroots groups and partners to take a leading role in the implementation of community-based projects with global environmental benefits. These include projects on climate change, conservation of biodiversity, protection of international waters, reduction of persistent organic pollutants [POPs], prevention of land degradation and generating sustainable livelihoods. The SGP’s Focal Point in Kiribati is Dr. Komeri Onorio, who is also the Secretary of the National Focal Group. He reports to Dr. Terence Hay-Edie, who looks after GEF Programmes in the Pacific. Other members of the NFG are from government departments, NGOs and women’s groups.